In the first series of Jaggery lit’s spotlight on “Artist Profile”, we sat down to talk with CA Rajasekar, violinist and teacher. Below are the excerpts of our conversation. Welcome Shri Rajasekar Sir to the first edition of Jaggery Lit’s spotlight on performing artists. We are so thankful for your time. How did you get attracted to violin? Please tell us about your background and your initial training. CARVA: I was born into a family of musicians and violinists. I am the fourth-generation violinist in my family. There has been an unbroken continuity in my family in learning this instrument. I was fortunate to be listening to classical Carnatic music and tunes from when I was in the womb. My father Shri. Chittoor Appanna Bhagavathar was a performing violinist. He along with his 3 brothers would practice and perform. There was hence a constant buzz of music at home. I would say I picked up the instrument rather naturally. However, my father initially taught me vocal music when I was about 3 years old. So, was your father your first Guru or teacher? CARVA: Yes, my father was my first teacher. As I said earlier, he taught me classical vocal. When I was about 7 years of age, he started to teach the basics of Carnatic classical music on the violin. He would later tell me that I was able to play the Geethams (small songs) with gamakams(musical accentuations given to a musical phrase or a single note, thus producing melodic tunes) as opposed to how a learner would initially learn. Songs are taught to learners as a plain musical note and the accentuations to make it more pleasing to hear like how a musician would sing the song are taught later. This is because the student has to get a hang of how to play the different notes first in the instrument. I later continued my learning from Sangita Kalanidhi Shri Dr. M. Chandrasekar. He helped me hone my skills more and I am ever grateful to him for letting me accompany him on stage on some of his performances. Was it easy to have your father as a teacher? Was he strict? CARVA: It was easy in the sense that I didn’t have to travel (laughs) for my classes. He was a teacher who also instilled the sense of discipline. He himself would spend hours practicing. He naturally expected it from all of his students. So as a beginner, I would have to practice at least 2 hours each day. I am thankful to him for setting me straight right in the beginning as the discipline really helped out. Can you elaborate that a bit more please? CARVA: Of course! The teaching continued and when I was a teenager, the interest kicked in even more. I would spend hours 6 – 8 hours practicing every day. Music got to me so much that after I finished my 10th grade in High School, I focused on my violin learning totally, that I did the reminder of my High School years by correspondence or home-schooling as you might want to call it. Oh Wow! That must have been a hard decision for you. CARVA: Well, I guess so for most people as the primary focus predominantly is on academics. But as far as I was concerned, I was very sure by then; that this is what I wanted to do. And I just went full throttle with it. By 16 years or so I started performing concerts as accompanying violinist. Between 17 – 22 years, I did a lot of travel worldwide being as part of dance group and being part of musical for various famous dancers. That must have given you a lot of exposure while still being a young adult. CARVA: Yes, it did. I was always interested in knowing to play Western Classical as well. I had a very curious mind to understand their script and their notation. While initially my father did not agree, he later saw my earnest seeking. I learnt Western Classical from Shri V. S. Narasimhan. He was one of the leading violinists for many famous music directors like Illayaraja and others. And how did that go? Did you find any major differences? CARVA: I would say that it helped me fix some techniques. Like I would say bowing for example. It really aided me in overall understanding of the instrument. I would say right now 91% of performing violinists in Classical Carnatic music these days have all undergone training in Western Classical as well. It is really easy for anyone to switch between the 2 classical forms if they have learnt one form very well. That is amazing. So, tell us more about how CARVA Trust came to existence and also about your Violin Ensemble. CARVA: Even though I was teaching violin for many years before as an independent teacher, I wanted to create an institute. However, with active concerts and performances throughout I did not have the time to make this more of a reality. In 2000, I created CARVA Trust (C A Rajashekar Violin Academy). I had about 50 students and they were are different levels(beginner/intermediate/advanced). An idea struck me, Why not create a violin ensemble with my students? It would be a great opportunity for the students to get on stage. Personally for me I thought that would be a motivation and encouragement for them. The audiences were enthralled to see a stage filled with violinists performing. Their response was more than encouraging. The auditorium was over flowing with people. Subsequently these continued for 14 years. My students from abroad would come and participate in these as well. I had about 150 students on stage performing the ensemble. It was just amazing. But these days I am focused on continuing the 2 music festivals that my father had started. CARVA: Sure. We do a Sadhguru Sri Thyagaraja Swamigal’s Krithi Akhandam Ganam. Akhandam really means continuous, in this case it is continuous music for 24 hours. The songs are compositions of the great Saint. Thyagaraja. However, no song is repeated and there is no break in music either. The musicians render songs as a concert with accompanists. Many of the senior and top artists perform on that day. This is a great opportunity for many junior artists. It is like a cloud burst of music. A great day of music to music lovers. The second festival is an offering or “Aradhana” to the great music saint Purandaradasa. Usually this is organized by January of every year. Amazing! Music to all senses, what a great offering! What else is hidden in this artist (laughs)? CARVA (laughs): Well, I did my “Isai Kalaimani” course from Adayar Music College in Chennai. I did finish BA from The Madras University. I also enrolled myself for MA in music at the University of Madras and was a Gold Medalist. I went on to complete M.Phil and my thesis was on “Teaching methodology and different types of teaching in Violin” where I was a rank holder. Now I teach many students worldwide. Technology has bought all of us closer, just like how this interview is now. I offer Skype (for long distance students) and also teach at home to seeking students on a 1 on 1 basis. That is fantastic! Technology has definitely made the world smaller indeed! It has been wonderful talking with you. Finally anything that would advise to students of music? CARVA: Well, if you are a student of music and more specifically if you are interested in Classical Carnatic music. First and foremost, you need to find a good teacher or Guru. Do spend some time in searching for a good teacher, this usually pays off in the end since you would have a good foundation. Second attend classes regularly. Third; Practice, practice and practice. There is no substitute to this. Fourth, listen to music of great stalwarts and musicians. The more you listen, the more you can understand music. If all of the above 4 are done well with full commitment, it is extremely easy to become a good performing artist. There is no other short cut. I wish and bless all of the students of music. May you find your journey fulfilling! Thank you so much Sir. It was a pleasure to talk with you. We at Jaggery Lit, wish you many more success and laurels. Shri. 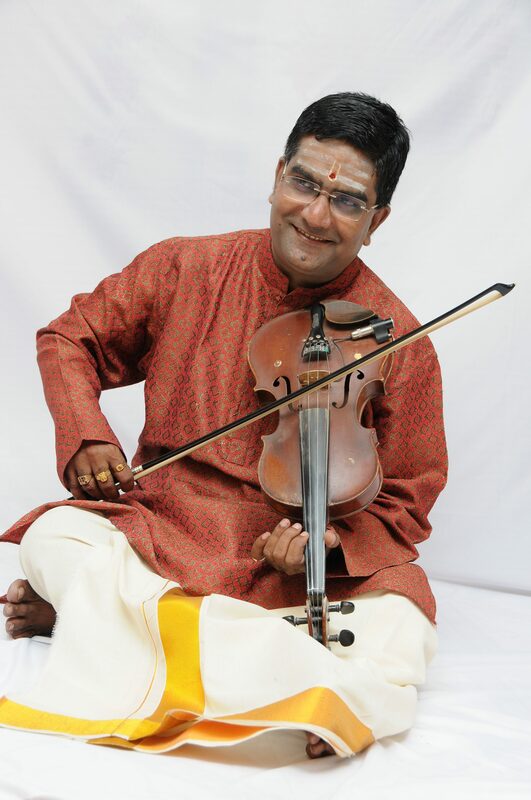 C A Rajasekar is a leading violinist and teacher. He plays classical Carnatic music on the Violin and is based in Chennai, India. He is the founder of “CARVA Trust” (Chittoor Appana Rajasekar Violin Academy) in Chennai, Tamil Nadu, India.